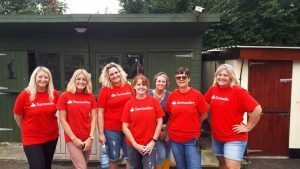 WOULD LIKE TO SAY a whopping ‘thank you’ to this fantastic team from Santander bank, who came out on Tuesday to help with maintenance jobs. The team, lead by Carol Bragg, powered deftly through all the tasks set, and impressed everyone with their enthusiasm and competence. Ladies, it was an absolute pleasure to have you here. You have made a huge difference, and the compliments are pouring in about how much better the front yard buildings look! If any of you want to come back, we’d be delighted to see you-you are welcome here anytime!